Israeli forces continued with systematic crimes in the occupied Palestinian territory (oPt) for the weeks of 06 – 12 September, 2018. Israeli forces continued to use excessive force against Palestinian protestors in the Gaza Strip and West Bank. Two children were killed, and a civilian succumbed to his previous wounds in the Gaza Strip. 171 civilians, including 36 children, 4 journalists and 5 paramedics, were wounded in the Gaza Strip. 12 civilians, including 4 children, were wounded in the West Bank. Israeli forces continued to use lethal force against Palestinian civilians, who participated in peaceful demonstrations organized within the activities of the “Great March of Return and Breaking the Siege” in the Gaza Strip, which witnessed for the 24th week in a row peaceful demonstrations along the eastern and northern Gaza Strip border area. During the reporting period, the Israeli forces killed 3 Palestinian civilians, including 2 children, while a fourth civilian succumbed to previous wounds in the Gaza Strip. Moreover, 171 civilians, including 36 children, 4 journalists, and 5 paramedics, were wounded. In the West Bank, the Israeli forces wounded 12 civilians, including 4 children. In the Gaza Strip, the Israeli forces killed 2 Palestinian children during the peaceful protest. On 07 September 2018, Belal Mustafa Mohammed Khafajah (17) from Rafah City was killed after being shot with a bullet to the chest. On the same day, Ahmed Musbah Ahmed Abu Tyour (16) was wounded with a bullet to the right knee during his participation in the Return and Breaking the Siege in eastern Rafah City. His death was declared the next day after succumbing to his wounds. A video showed Abu Tyour being shot with a bullet while jumping and making the victory sign around 20 meters away from the Israeli snipers who directly shot him without posing any threat to them. On 07 September 2018, medical sources at al-Shifa Hospital in Gaza declared the death of Amjad Hamadonah (19) from Jabalia refugee camp in the northern Gaza Strip after succumbing to wounds he sustained during his participation in the Return and Breaking the Siege March on 13 July 2018 in eastern Abu Safiyah Hill in eastern Jabalia. He was wounded with a bullet to the left knee, cutting the main artery, and at that time, his condition was described as serious. In a different crime, 09 September 2018, Israeli forces killed ‘Etaf Mohammed Musleh (29) from al-Nuzha Street in Jabalia. The Israeli forces opened fire at him when he along with other civilians approached the border fence in eastern Abu Safiyah Hill, northeast of Jabalia in the northern Gaza Strip. An Israeli force then moved into the area to evacuate the body of the above-mentioned civilian. His death was later declared while his body is so far under the Israeli custody. As part of targeting Palestinian fishermen in the Gaza Sea, the Israeli forces continued to escalate their attacks against the Palestinian fishermen, pointing out to the ongoing Israeli policy of targeting their livelihoods. During the reporting period, PCHR documented 2 shooting incidents at the fishing boats. In the West Bank, during the reporting period, the Israeli forces wounded 12 Palestinian civilians, including 4 children, in addition to dozens suffering tear gas inhalation. Three of those wounded were wounded during the peaceful protests against settlements. During the reporting period, Israeli forces conducted at least 47 military incursions into Palestinian communities in the West Bank and 2 similar ones into Jerusalem and its suburbs. During those incursions, Israeli forces arrested at least 19 Palestinians, including 3 children in the West Bank. Meanwhile, five other civilians were arrested in Jerusalem and its suburbs. Only one of them, a child, is so far under arrest while the rest were released, including an Islamic Endowments Officer, girl, her aunt and the latter’s husband after denying them the entry into al-Aqsa mosque for various periods. As part of demolitions, on 06 September 2018, the Israeli forces levelled a 300-square-meter land near Deiristiya village entrance, north of Salfit, in a prelude to confiscate it, noting that its owner was about to build a commercial facility on it as he had obtained a license for this upon a letter he sent to the Palestinian Military Liaison and in coordination with the Israeli Liaison. It should be noted that the land is adjacent to his house. As part of the Israeli settlers’ attacks against Palestinian civilians and their property, on 06 September 2018, a group of settlers set fire to a big batch of construction wood boards in Khelet al-Wusta area between the villages of Qasrah and Jaloud in Nablus. On 08 September 2018, a number of settlers living in the settlement outposts of Hebron’s Old City closed al-Sahlah Road in front of a PRCS ambulances that was carrying a patient on the closed Shuhadaa’ Street and threw stones at it. As a result, the lights and rear window were damaged and the sides were affected as well. On 09 September 2018, a number of settlers damaged and broke the branches of 18 ancient trees using saws in al-Hamrah area, east of Kherbet Tawanah to the east of Yata in southern Hebron. It should be noted that the village has been subject to repeated attacks by settlers, including their attempts to intimidate students and deny them access to their schools in the village in addition to attacking the shepherds. At approximately 07:00 on Friday, 07 August 2018, medical sources at al-Shifa Hospital in Gaza City announced the death of Amjad Fayez Ahmed Hamadonah (19) from Jabalia refugee camp in the northern Gaza Strip, succumbing to wounds he sustained during his participation in the March of Return and Breaking Siege on 13 July 2018, east of Abu Safiyah Hill, northeast of Jabalia. Amjad was hit with a live bullet to the left knee, cutting the main artery. He had received medical treatment at al-Shifa Hospital until his death was announced on the abovementioned day. At approximately 16:30 on the same day, thousands of civilians, including women, children and entire families, started swarming to the 5 encampments established by the Supreme National Authority for the Great March of Return and Breaking Siege along the border fence, east of the Gaza Strip governorates. They raised flags and chanted national songs and slogans against Trump’s decision to cut US funding for UNRWA. Hundreds, including children and women, approached the border fence with Israel, set fire to tires and gathered 300 meters away from the main border fence. Some of them attempted to throw stones at the Israeli forces and pulled parts of the barbed-wire fence established inside the Palestinian territories. The Israeli snipers stationed behind sand barriers along the border fence deliberately and selectively opened fire at the protestors, who were 300 meters away from the main border fence, and fired tear gas canisters. As a result, several casualties were reported. 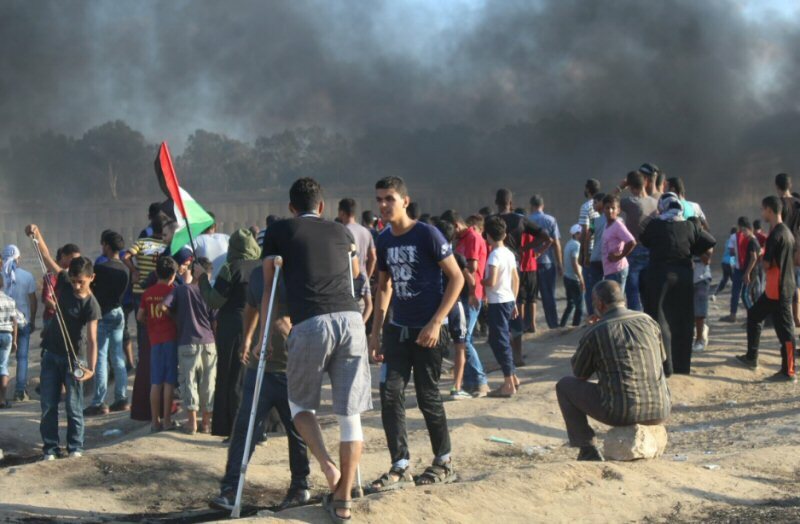 The Northern Gaza Strip: clashes, which erupted in eastern Jabalia, resulted in the injury of 27 civilians, including 8 children and 3 paramedics. Twenty one of those wounded, including 7 children, were hit with live bullets and their shrapnel in addition to Nabil Mahmoud Mohamed Abu Saqer (38), a paramedic at the Military Medical Services, who was hit with a live bullet to the left leg. Moreover, 6 civilians, including a child, were hit with tear gas canisters. In addition, Mohammed Zeyad al-‘Abed Abu Foul (26), a paramedic at PRCS, was hit with a tear gas canister to the left shoulder, and Fadi Osamah Abdul Rahim ‘Ali (23), a paramedic at PRCS, was hit with a tear gas canister to the left foot. The wounded civilians were transferred to the Indonesian and al-‘Awda Hospitals. Doctors classified the injuries of 4 civilians as serious while other civilians’ injuries were between minor and moderate. Gaza City: clashes, which erupted in eastern al-Sheja’eyah neighborhood, resulted in the injury of 51 civilians, including 4 children. The Central Gaza Strip: clashes erupted in 3 points: the school gate, Um Hasaniyah Hill and then the young men moved into Abu Qatroun area in the north. As a result, 16 civilians, including 5 children, were hit with live bullets and their shrapnel. The wounded civilians were transferred via PRCS ambulances to al-Aqsa Hospital. Doctors classified the civilians’ injuries between minor and moderate. Moreover, dozens of civilians suffered tear gas inhalation. Some of them were transferred to the hospital while other received medical treatment on the spot. Khan Younis: clashes, which erupted in the east of Khuza’ah, resulted in the injury of 26 civilians, including 8 children and a Civil Defense paramedic, were wounded. Seventeen of them were hit with live bullets and 9 others were hit with tear gas canisters. Moreover, dozens of civilians suffered tear gas inhalation. The wounded civilians were taken to the field hospital and then transferred to Nasser, Gaza European and al-‘Awda Hospitals in the city. According to observations by PCHR’s fieldworker, the Israeli forces heavily deployed in the border area amidst heavily firing of live bullets and tear gas canisters. As a result, the number of casualties increased comparing with the last weeks, despite the peaceful nature of most of the demonstrations. Mahmoud Mohammed Sa’ed Shata (25), a reporter at “Rowad Al-Haqiqa” Network from Rafah, was hit with a live bullet to the left thigh. Nash’at Nasim Khalil Na’im (20), a reporter at Barq Gaza Network from Beit Hanoun in the northern Gaza Strip, was hit with a live bullet to the left arm. The wounded civilians were taken to the medical point in the Return encampment, east of Rafah and then transferred to Abu Yusuf al-Najjar hospital in Rafah and Gaza European Hospital in Khan Younis. Doctors classified 5 civilians’ injuries as serious. One of them namely Ahmed Mesbah Ahmed Abu Toyour (16)died at approximately 10:15 on Saturday, 08 September 2018 at Gaza European Hospital in Khan Younis, succumbing to wounds he sustained after he was hit with a live bullet to the right knee. Ahmed was wounded when he was in front of a site belonging to the Israeli snipers, 20 meters into the west of the border fence between the Gaza Strip and Israel Ahmed threw a stone at the soldiers’ site, raised the victory sign and jumped and exclaimed before them. after his injury, Ahmed underwent 2 surgeries that continued for 6 hours and he received 30 blood units. He was then admitted to the Intensive Care Unit (ICU) until his death was announced. At approximately 16:00 on Monday, 19 September 2018, dozens of Palestinian civilians gathered near the coastline between the Gaza Strip and Israel upon calls from the Supreme National Authority for the Great March of Return and Breaking Siege in which they called for participation in the Return coastal camp, which was established on Monday morning, adjacent to “Zikim” military base , northwest of Beit Lahia in the northern Gaza Strip. It should be noted that this is the seventh time for Palestinian boats to sail for Breaking the Siege from Gaza Seaport towards the northern Gaza Strip coastline adjacent to the abovementioned camp. The Israeli gunboats heavily opened fire and fired a number of sound bombs at the boats of Breaking the Siege that approached the water barrier established by the Israeli forces and extends to the border fence. The Israeli forces claimed that they established the border fence fearing of naval infiltration. Fifteen civilians, including 3 children, were hit with live bullets and its shrapnel. Among those wounded was ‘Atiyah Nasser Ahmed Hejazi (28), a photojournalist at al-Manarah News Agency from Sheikh Redwan neighborhood in Gaza City, was hit with a live bullet to the right knee. Moreover, 18 civilians, including 5 children, were hit with tear gas canisters. Among those wounded was Hasan Rateb Hasan al-‘Esawi (41), a volunteer paramedic at the Palestinian Ministry of Health from Khan Younis, was hit with a tear gas canister to the head, and HuseinJamal Mohammed Mansour (26), a photo journalist at Shams News and the Guardian News Agency from al-Buraij refugee camp, was hit with a tear gas canister to the head. The wounded civilians were transferred via ambulances belonging to PRCS and Medical Services to the Indonesian and al-‘Awda Hospitals. Doctors classified 2 civilians” injuries as serious while the other civilians’ injuries were between minor and moderate. Following the Friday Prayer on 07 September 2018, dozens of Palestinian civilians and international human rights defenders gathered on agricultural lands of al-Resan Mount area, west of Ras Karkar village, west of Ramallah in protest against the Israeli settlers’ attempt to seize and confiscate the land. When the civilians arrived at the abovementioned area, the Israeli soldiers fired live and rubber bullets, sound bombs and tear gas canisters at the protestors. As a result, a 22-year-old civilian was hit with a rubber bullet to the right hand sustained wounds to the right foot, a 19-year-old civilian sustained wounds to the right foot and a 29-year-old civilian sustained wounds to the foot. The wounded civilians were taken via a PRCS ambulance to Palestine Medical Complex to receive medical treatment. Doctors classified their injuries as minor. Moreover, dozens of civilians suffered tear gas inhalations while others sustained bruises throughout their bodies due to being heavily beaten by the Israeli soldiers. The Israeli forces also arrested ‘Amr Rajeh ‘Obaidah (17), and Abdul Hakim Mohammed Abu ‘Adi (14). Around the same time, dozens of Palestinian civilians and international and Israeli human rights defenders organized peaceful demonstrations in protests against the annexation wall and settlement activity in Ni’lin and Bil’in villages, west of Ramallah. Israeli forces used force to disperse the protestors by firing live and rubber bullets, sound bombs and tear gas canisters at them. They also chased them into olive fields and between houses. As a result, dozens of civilians suffered tear gas inhalation while others sustained bruises after Israeli soldiers beat and pushed them. Around the same time, dozens of Palestinian civilians from Kherbat Qalqas, south of Hebron, and international and Israeli human rights defenders organized a peaceful demonstration at the entrance to Kherbat Qalqas, which has been closed for 19 years. The protestors demanded to open the entrance. They raised flags and chanted slogans. Large Israeli forces arrived at the area and prevented the civilians from reaching the Bypass Road (60), which connects the village. After half an hour, the soldiers fired sound bombs at the participants, forced them to leave the area and announced it a military closed zone. As a result, a number of civilians suffered tear gas inhalation. It should be noted that Kherbat Qalqas is inhabited with around 3000 persons is separated from the other neighborhoods of Hebron by Road (60). In addition, all life forms are connected with Hebron as the inhabitants receive medical services and many of them work at Hebron, Moreover, about 100 high school and university students daily go to educational institutions in the city. At approximately 06:20 on Thursday, 06 September 2018, Israeli forces leveled a 400-square-meter land near the entrance to Dirsitiyia village, north of Salfit, in a prelude to confiscate it. The plot of land belongs to Ibrahim Mostafa Abu Zaid and was leveled under the pretext of being within Area C that is under the Israeli control. The land’s owner was intending to build a commercial facility on it as he had obtained a construction license to build it after sending a letter to the Palestinian Military Liaison which coordinated with the Israeli Liaison in this regard. It should be noted that the abovementioned land was adjacent to his house. On Thursday morning, 06 September 2018, a group of Israeli settlers from “Isch Kudz“ settlement outpost established on Jaloud village’s lands from the eastern side, southeast of Nablus, set fire to a big batch of construction wood boards belonging to Dawwoud ‘Obaid al-‘Issawiy in Khelit al-Wusta area between Qasrah and Jaloud villages. This new attack in the abovementioned area came to be listed within the series of ongoing attacks by the Israeli settlers against Palestinian civilians and their property in “Isch Kudz “settlement outpost in the outskirts of Jaloud village. At approximately 16:00 on Saturday, 08 September 2018, a number of Israeli settlers from settlement outposts in Hebron’s Old City, closed al-Sahlah Street in front of a PRCS ambulance. The PRCS arrived to take a patient from the closed al-Shuhadah Street. The settlers threw stones at the ambulance, causing material damage to it. The Israeli forces stationed in the Old City’s neighborhoods arrived at the area and allowed the PRCS ambulance to leave without chasing the settlers involved in the incident. On Sunday, 09 September 2018, a group of Israeli settlers from “Havat Maon“ settlement established on Kherbit Towanah lands, east of Yatta, south of Hebron, damaged and cut with electric saws the branches of around 18 ancient trees belong to al-Rab’I Family in al-Hamrah area, east of al-Kherbah. When farmers arrived at the area, the Israeli police came to the area, opened an investigation and asked the affected persons to submit a complaint in “Kiryat Arba“ Police Station. It should be noted that Kherbit Towanah is exposed to ongoing attacks by the Israeli settlers who attempt to intimidate students and deny them access to their schools in the village in addition to attacking shepherds. The per head income declined along with agricultural production shrinking by 11 percent, as socioeconomic conditions in the past year worsened, UNCTAD said in it its yearly report on its assistance to the Palestinian people. "Economic prospects are bleak due to risky political horizons and unfavorable trends in aid, Gaza's reconstruction and credit-financed expansion in consumption," said the executive summary of the report. "Poor economic performance is caused by restrictive measures imposed by the occupying power," said the report in reference to Israel. It warns that declining donor support, a freeze in the reconstruction of Gaza and unsustainable, credit-financed public and private consumption paint a bleak picture for future growth. Prospects for the Palestinian economy are further clouded by the ongoing confiscation of land and natural resources by Israel. "Under international law, Israel and the international community have responsibilities not only to avoid actions that impede development but to take affirmative steps to foster development in the Occupied Palestinian Territory," said Mahmoud Elkhafif, Coordinator of the UNCTAD Assistance to the Palestinian People Unit. However, the report said Israel has failed to ease restrictions and donor support has declined steeply to one-third of its 2008 level. 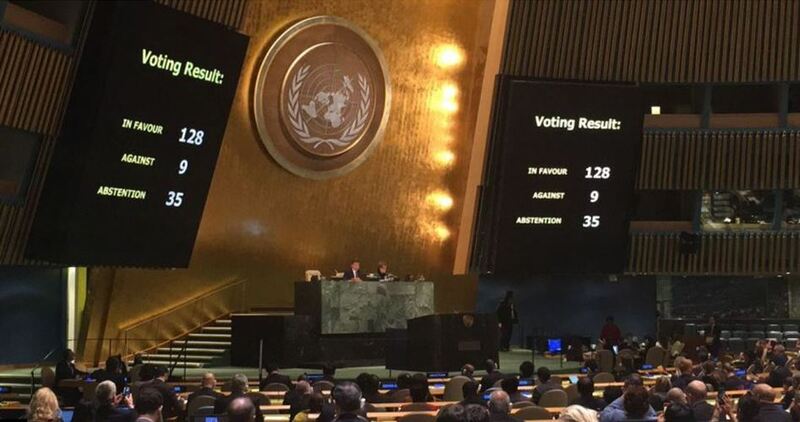 Incremental annexation in the West Bank and expansion of illegal settlements accelerated in 2017 and 2018 despite a UN General Assembly resolution in December 2017. The report highlights evidence of incremental annexation of large parts of the West Bank that includes the transfer of Israeli population into settlements, the forcing out of the Palestinian population, investment of more than 19 billion U.S. dollars in the construction of settlements. Turning to a blockade Israel has on Gaza, the report said this is now in its 11th year and "the Gaza Strip has been reduced to a humanitarian case of profound suffering and aid dependency," the report says. Gaza's productive capacity has been stripped by three major military operations and a crippling air, sea and land blockade. The 2008-2009 Israeli military operation erased more than 60 percent of Gaza's total stock of productive capital, and the 2014 strike destroyed 85 percent of what was left. According to the report, destroyed productive assets include roads, power stations, industrial and commercial establishments, and agricultural land, as well as other infrastructure and related assets. In 2012, the UN warned that unless ongoing trends were reversed, Gaza would become uninhabitable and unfit for humans to live in by 2020. Since then, the report says, all socioeconomic indicators have deteriorated and conditions in Gaza are now worse. On the occasion of the International Literacy Day, the Palestinian Central Bureau of Statistics (PCBS) published a report last week on the illiteracy rate in Palestine and confirmed that it is one of the lowest in the world. UNESCO Institute for Statistics reported that the illiteracy rate among individuals of 15 years and above in Arab countries was 24.8% (about 64.6 million illiterate) in 2016. For males, 17.4% (23.7 million illiterate) compared to 32.8% for females (40.9 million illiterate). For the same year, the rate was 13.8% (about 750.1 million illiterate) in the world among the same age group: for males, 10.2% (277.2 million illiterate) compared to 17.3% for females (472.9 million illiterate).